As a result of their westward explorations and their settlement of Greenland, the Vikings sailed as far north and west as Ellesmere Island, Skraeling Island and Ruin Island for hunting expeditions and trading with Inuit groups. The subsequent arrival of the Little Ice Age is thought to have been one of the reasons that further European seafaring into the Northwest Passage ceased until the late 15th century. The first recorded attempt to discover the Northwest Passage was the east-west voyage of John Cabot in 1497, sent by Henry VII in search of a direct route to the Orient. In 1524, Charles V sent Estêvão Gomes to find a northern Atlantic passage to the Spice Islands. An English expedition was launched in 1576 by Martin Frobisher, who took three trips west to what is now the Canadian Arctic, in order to find the passage. Frobisher Bay, which he first charted, is named after him. As part of another hunt, in July 1583 Sir Humphrey Gilbert, who had written a treatise on the discovery of the passage and was a backer of Frobisher, claimed the territory of Newfoundland for the English crown. On August 8, 1585, the English explorer John Davis entered Cumberland Sound, Baffin Island. The major rivers on the east coast were also explored in case they could lead to a transcontinental passage. Jacques Cartier’s explorations of the Saint Lawrence River were initiated in hope of finding a way through the continent. Indeed, Cartier managed to convince himself that the St. Lawrence was the Passage; when he found the way blocked by rapids at what is now Montreal, he was so certain that these rapids were all that was keeping him from China (in French, la Chine), that he named the rapids for China. To this day, they are the Lachine Rapids. In 1609 Henry Hudson sailed up what is now called the Hudson River in search of the Passage; encouraged by the saltiness of the water, he reached present-day Albany, New York, before giving up. He later explored the Arctic and Hudson Bay. In 1611, while in James Bay, Hudson’s crew mutinied. He and his teenage son John, along with seven sick, infirm, or loyal crewmen, were set adrift in a small open boat. He was never seen again. Cree oral legend reports that the survivors lived and traveled with the Cree for more than a year. On May 9, 1619, under the auspices of King Christian IV, Jens Munk set out with 65 men and the King’s two ships, the Einhörningen (Unicorn), a small frigate, and Lamprenen (Lamprey), a sloop, which were outfitted under his own supervision. His mission was to discover the Northwest Passage to the Indies and China. Munk penetrated Davis Strait as far north as 69°, found Frobisher Bay, and then spent almost a month fighting his way through Hudson Strait. In September 1619 he found the entrance to Hudson Bay and spent the winter near the mouth of the Churchill River. Cold, famine, and scurvy killed so many of his men that only two sailors and himself survived. With these men, he sailed for home with the Lamprey on July 16, 1620, reaching Bergen, Norway, on September 20, 1620. René Robert Cavelier, Sieur de LaSalle built the sailing ship, Le Griffon, in his quest to find the Northwest Passage in the upper Great Lakes. Le Griffon disappeared in 1679 on the return trip of her maiden voyage. In the spring of 1682, LaSalle made his famous voyage down the Mississippi River to the Gulf of Mexico. LaSalle led an expedition from France in 1684 to establish a French colony on the Gulf of Mexico. He was murdered by his followers in 1687. In 1772 Samuel Hearne travelled overland northwest from Hudson Bay to the Arctic Ocean, thereby proving that there was no strait connecting Hudson Bay to the Pacific Ocean. Although most Northwest Passage expeditions originated in Europe or on the East coast of North America and sought to traverse the Passage in the westbound direction, some progress was made in exploration of its western end as well. In 1728 Vitus Bering, a Danish Navy officer in Russian service, used the strait first discovered by Semyon Dezhnyov in 1648 but later accredited to and named after Bering (the Bering Strait), concluding North America and Russia were separate land masses. In 1741 Bering, with Lieutenant Aleksei Chirikov, went in search of further lands beyond Siberia. While separated, Chirikov discovered several of the Aleutian Islands while Bering charted the Alaskan region before the scurvy-ravaged ship was wrecked off the Kamchatka Peninsula. 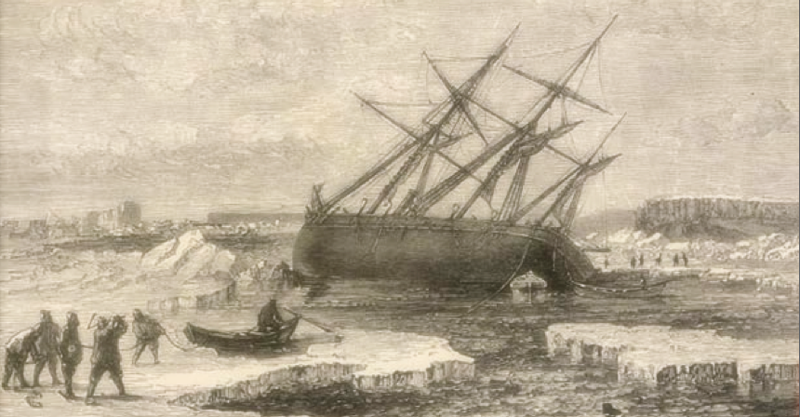 In 1762, the English trading ship Octavius reportedly hazarded the passage from the west but became trapped in sea ice. In 1775, the whaler Herald found the Octavius adrift near Greenland with the bodies of her crew frozen below decks. Thus the Octavius may have earned the distinction of being the first Western sailing ship to make the passage, although the fact that it took 13 years and occurred after the crew was dead somewhat tarnishes this achievement. The veracity of the Octavius story is still in question. The Spanish made numerous voyages to the northwest coast of North America during the late 18th century. Determining whether a North West Passage existed was one of the motivations for this effort. Among the voyages that involved careful searches for a Passage include the 1775 and 1779 voyages of Juan Francisco de la Bodega y Quadra. The journal of Francisco Antonio Mourelle, who served as Quadra’s second in command in 1775, fell into English hands and was translated and published in London. Captain James Cook made use of the journal during his explorations of the region. In 1791 Alessandro Malaspina sailed to Yakutat Bay, Alaska, which was rumoured to be a Passage. In 1790 and 1791 Francisco de Eliza led several exploring voyages into the Strait of Juan de Fuca, searching for a possible Northwest Passage and finding the Strait of Georgia. To fully explore this new inland sea an expedition under Dionisio Alcalá Galiano was sent in 1792. He was explicitly ordered to explore all channels that might turn out to be a Northwest Passage. The world is not on track to meet the target agreed by governments to limit the long-term rise in the average global temperature to 2 degrees Celsius (°C).Global greenhouse gas emissions are increasing rapidly and, in May 2013, carbon-dioxide (CO2) levels in the atmosphere exceeded 400 parts per million for the first time in several hundred millennia. · Adopt specific energy efficiency measures (49% of the emissions savings). · Minimise the construction and use of the least-efficient coal-fired power plants (21%). · Minimise methane (CH4) emissions from upstream oil and gas production (18%). · Accelerate the (partial) phase-out of subsidies to fossil-fuel consumption (12%). The world is on a once-off transition to sustainability. Take action and sign this petition today. There was lots of wildlife. It sure got windy out there this summer! !